This week’s post opens like a message from the Roman Empire! 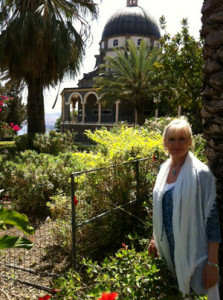 I’m writing to you from my lap as we leave the town of Tiberius on the banks of the lake called the Sea of Galilee. Those of you who have been to the Holy Land will be able to understand me when I tell you this has been one of the most powerful and special places I have ever travelled to. Firstly let me introduce the group. There are ninety two people from all over the world. There are beautiful souls joined together from the four corners including the South Americas, USA, Britain, Ireland, and all over Europe. Many of the group have travelled with the organiser James Tyberon (Tyb) many times to Sacred sites all over the world. For me it’s the first time I’ve travelled with him as a leader, although I have enjoyed listening to his channellings from the Archangel Metatron from his website (Earth Keepers). I have to say he is a great leader, and creates a very safe and magical group energy – even with such a huge number. On arrival in Jerusalem we enjoyed the cultural differences and the evidence of one of the most powerfully historic religious practices of the world. I’m really looking forward to the three days of exploring this ancient city at the end of our trip. On our first day we went to Nazareth, where the family of Jesus lived. We felt the strong presence of the ‘Essene’ energy here, and especially in the church built over the cave-house said to be his original family home. Yes it’s true, the villages were mostly built around cave centres and small houses were all carved or built from the hillside stone. Here my husband Brian and I were so moved by a group of Ethiopian Gnostic Christians who were praying together and singing in such beautiful harmony, it brought us both to tears. I thanked one of these beautiful ladies in her white head dress… and she kissed me, which brought more tears to my eyes! Yesterday we were all taken on a boat to the centre of the Lake. For those of us who have loved the Bible stories of Jesus walking the banks of Galilee, choosing his Disciples, calming the storms, and walking on the water, you will understand the powerful emotions this brought to this whole group of spiritual seekers. The boat stopped and the captain cut the engines. Tyb explained the significance of the topography and power of the energy of the lake within the valley and then we held a meditation including sending three powerful ‘Aum’ chants for peace to the world. It was a truly amazing experience to treasure for ever. Today we pass into Jordan for our visit to Petra, then on to the Dead Sea to bathe in the salts there and refresh our bodies. I will write more in my blog about the Dead Sea, but in the meantime I leave you with one of my photos (I’ll post more on Facebook and my blog over the coming days) and hope that you will feel the blessings I continue to send you from this ancient and sacred land.